Ha thats great, someone has had far too much free time. Haha I am happily suprised. I'm just waiting to hear what the numbers are on this costume. A DTA chastity belt ... what else !! superb info work ... did you do that alone brother Ezekiel ? Is it your profession ? cause it seems professional to me !! by the way... the surroundings seems a little odd with a GK ... it's a little like : Stern at the farm ! I can't hog the glory,I'm no costume maker and never was good with this sort of thing. I was just "chosen". 2 friends of mine love making costumes, everything from Power Armor in 40K,to Chaos Armor in Fantasy, Spartan armor from Halo series, Marine armor from Starcraft series, costumes from games like Samurai Warriors and Dynasty Warriors series and so forth. The reason I get any of the glory is because they usually desing the costumes for me,partly because I introduced them to the worders of game costumes and partly because I have the physique fit for 'em and can carry them without much trouble. I mean they once made a full plate armor that knights used to wear! So then there is only one question. That is a very cool cosplay costume, my friends would propably be interested in how it was made. But I think that we compeate in a little different categories with the miss, as she offers beutiful and graceful and I more of manly and powerful, in my opinion atleast. So that is you in the costume? Klomster wrote: So that is you in the costume? Building a purifier army will negate the respect you get for how cool that photo looks. It's a good costume, no doupt of that. But I myself always picture the Space Marine inside bulky,muscular etc. and in my opinion it's rather difficult to achive that look as an asian man. As is with that picture, no offense intended, but the builds of african, native american, european, asian and etc. are all different in some aspects and for me I can picture the european as a Space Marine the easiest due to the body structure they have. This of course is everyones personal preference, but I think that I managed to capture the Marine "look" a little better than the asian guy depicted here. WHAAHAHAHAHAHAHAHAHA!!!! It would apear that the "corruptor" has become the "corrupted"!!!! Welcome to the good guys side!!! Europeans, and especially nordic people are stockier and of bulkier frame because of the climate they live in. As we are better suited for some climate, the asians are better suited for another climate. Hmmm, your friends do make awesome suits. I'm almost tempted to ask, could your pals make a dragon-scale power armour on demand? With handsome rewards of course. 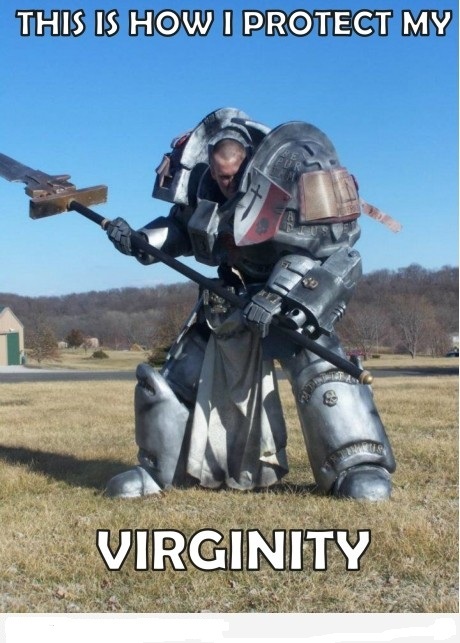 Yeah,I mean the Space Marines are supposed to be superhuman giants and if I am bulkier and taller than the guy in power armor, it doesn't really have the right feel for me. But for example Tau and Eldar would be impossible for me to pull of due to that same body build that I think makes me a "real" looking space marine. On the pepakura, I'll need to ask my friends for specifics, since as I said, I only act as the carrier for their products so I haven't asked nor been interested that much in the art of costume making. And on that note, sorry to say Klomster, I have asked my friends why they do the costumes, but not form a bussness around it since I think they are remarkably good. They answered that it's a more of a question of inspiration for them and as such they couldn't wholeheartedly( I think that's the right way to describe it anyway) get behind a costume that they themselves hadn't thought up, making bussness impossible for them in that way. But say if one could inspire them enough they would make the costume right ??? Don't worry, i won't start stalking your friends. Just interested in the stuff since it seems fun. Have been on 405th.com (halo armour community) and some people on it sometimes make space marine armour......... let's say it's not even quarter as good as this one here at times. Mostly since parts are mis-scaled. Yeah well sometimes people start to think that Halo armor would be the same kind as a Space Marine, made to be usually as light as possible and go along the line of your body rather than the bulky kind that it really is. And vice versa, because well I have seen Halo armor that was similarly bulky as a Space Marine one and well, it didn't look so good eather. But yeah I'll tell 'em you appriciate the work. But the thing with the other costume makers is that, well unlike most costume maker, I actually had the Halo suits that I have had to wear, made of real metals, which weights a fair amount and usually cosplayers aren't the types to have the muscles needed or the will to endure that for a whole weekend like the usual cosplay meet over in Finland,so they are satified with less costly and also light weight version at the expense of how "real" it looks.